The iRobot Braava 380t is the Robot Mop for multiple rooms and large spaces*, providing hassle-free mopping and sweeping to tackle everyday dirt and grime. Never let the dust settle by putting bObi Classic in charge of cleanup duties. Her compact frame furnishes back-to-back brushes and a TurboLift vacuum, but she makes it look easy with only three touchscreen commands: WAFFLE for dense sweeping and vacuuming of small areas, JUICE to power up when low on energy, and GO! to make bObi go! But if you want greater control with even less effort, just look no further than bObi's remote which lets you schedule up to 7 days' worth of automated cleaning. bObi Pet is the robot vacuum cleaner you've always wished for. Her back-to-back brushes and TurboLift vacuum swallow up pet hair and dust bunnies like nothing else, and her three-button touchscreen is coated in bObsweep's signature TouchMe texture to provide a silky, luxurious feel. Set her to work with a single tap, or program a whole week's worth of chores on her easy-to-use remote. bObi uses over 80 obstacle sensors to ensure she doesn't tumble or crash, and she'll even stay out of restricted zones that you can create with bObi blOck. Pick up what your pets left off with bObsweep PetHair Plus. This powerful robot vacuum sports a 4X boosted suction to lift out dirt from the deepest reaches of carpet. His roomy 1100 mL dustbin holds enough fur to handle the hairiest of pets, and his FullCommand remote lets you schedule cleaning times in a flash. You can even create digital barriers in up to two directions using blOck Plus. Give your home the superstar treatment with Bob PetHair Plus! Meet the robot vacuum cleaner that's friendly with pets but tough on grime. bObsweep PetHair looks for fur and paw prints on your floor and sweeps them into a jumbo 1100 mL dustbin. His TurboLift vacuum and extra-long main brush dig deep into carpets to pull out hair and dirt, while a filter smothers airborne allergens. When his battery dips below 15%, he returns to his charging station automatically. No matter what kind of mess your house is in, Bob is always ready to clean it up. 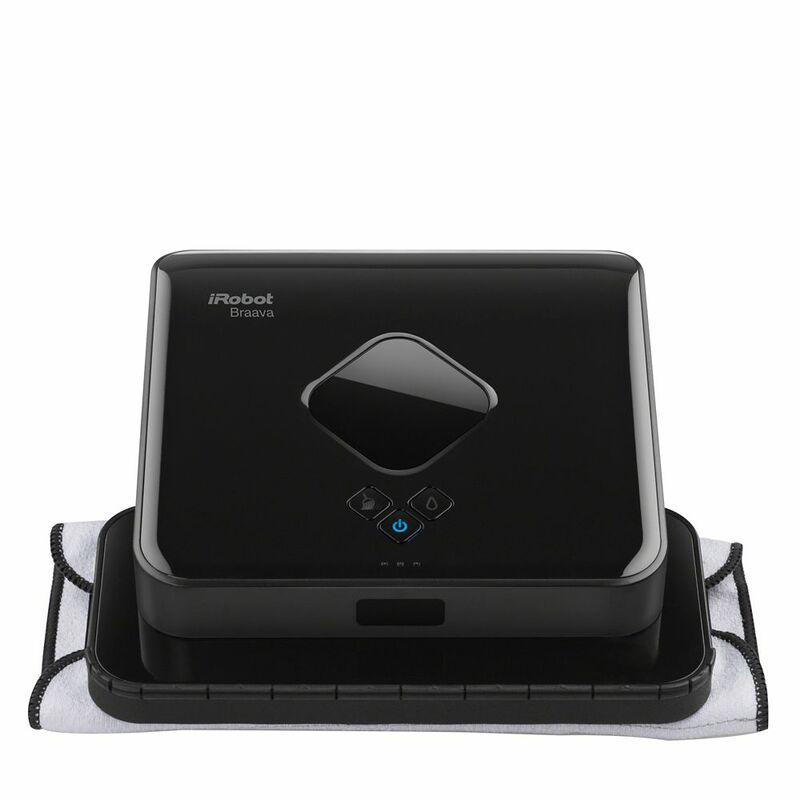 Braava 380t Robot Mop The iRobot Braava 380t is the Robot Mop for multiple rooms and large spaces*, providing hassle-free mopping and sweeping to tackle everyday dirt and grime. Braava 380t Robot Mop is rated 4.1 out of 5 by 161. Rated 5 out of 5 by John from Solid Product! Its a time machine - get hours back! We purchased a Roomba in December and loved it so much that we followed up with a Bravaa in April. I bought these as I thought that vacuuming and mopping were taking hours of out of our week that we could get back with our iRobot army. My wife was skeptical at first, but now employs both on almost a daily basis (our iRobot has about 160 hours running time in 4 months!). Bravaa is a little quirky at times with getting the mop attached properly, but overall it does a great job on both dry and wet modes. Its eerily quiet compared to Roomba. Highly recommend! Rated 3 out of 5 by Jaya from It doesn’t mop too well, harder in weird shaped houses... It doesn’t mop too well, harder in weird shaped houses it missed a whole section. Rated 5 out of 5 by KBG from So far so good.. I bought this a Christmas present for my wife.. She is loving it. So far so good.. I bought this a Christmas present for my wife.. She is loving it. Rated 5 out of 5 by Big Ben best from It mopped very well so far! I will be using this service again and again but charges so much more than Roomba.